Sinergo headquarters are located in an old farmhouse, in the surroundings of Venice. 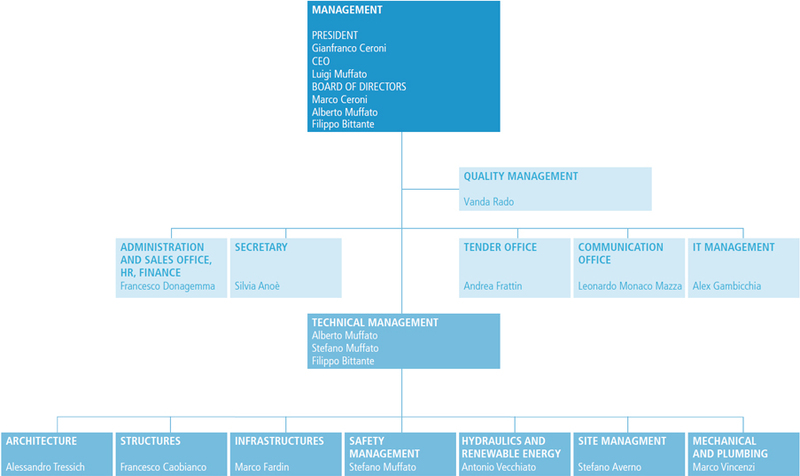 Its organizational chart is the merger of Sinergo Engineering and Elettrostudio, two engineering companies which have been working for thirty years in the fields of architectural design, structural design, infrastructure and MEP engineering. Taking advantage of the skills and expertise of these two founding companies, merged in 2008, during the last decade Sinergo has worked on many important multidisciplinary projects – carrying out both the design and the building process. Sinergo is made up of different departments, working in the field of architectural design, structural design, infrastructure design, water projects, MEP design. As part of the permanent staff, a specific department develops designs in the field of renewable energies – for the use of solar thermal energy, wind power, hydropower and energy from biomass. Many of these projects are developed together with Elettrostudio Group, which is Sinergo’s main partner and stakeholder. Its organization, dimension and know-how make Sinergo an ideal partner for the development of complex and multidisciplinary projects – following the whole process, from design concept up to consultancy, tendering, building, follow-up, site managing, safety. Sinergo’s staff, which includes an administration office, a procurement department and its management, counts more than 50 employees – among which architects, structural and infrastructural engineers, MEP and hydraulic engineers.